We promised you to get into more detail about the gaming capabilities of the Apple iPad Internet tablet and now we are delivering. We will show you a few videos, demonstrating some of the games available in the App Store to give you a better idea of what playing on the iPad is like. 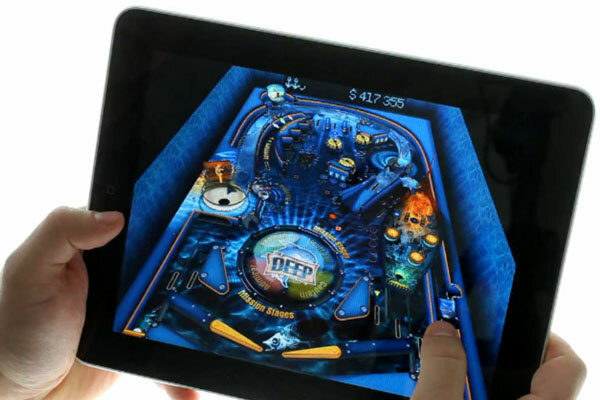 The first title we are going to introduce is the iPad version of the all too popular Pinball. We have a feeling that all fans of the classic arcade game will appreciate this title as its graphics and performance are simply great. You get to pick between three different playfields, switching between them is done by vertical swipes at the start screens. Each of them has a cool intro video that plays until you interrupt it by taping on the screen and begin the actual game. There is also a map with detailed information about each of the playfield’s elements. In the game itself you can pick between portrait and landscape orientation, which also differ in terms of gameplay. When in portrait, you get much more eye-candy with the virtual camera zooming in on the ball at times and changing the viewing angle, while the landscape mode gives you a static view of the playfield. Since we got bored with the visual effects after a while, we preferred the landscape mode. Not to mention that the iPad is more comfortable to hold that way and your hands don’t tire as quickly. Operating the flippers is pretty natural – a tap on the right half of the display activates the right one(s), while pressing on the left triggers the left one(s). Check it out in the video below.